OSU Extension in celebrating its 100th anniversary in Clackamas County with the approval of a new Education Center. During their April 3 work session, Clackamas County commissioners voted unanimously to approve plans for the Education Center on the southeast corner of Warner Milne and Beavercreek Road. Over the past century, Extension has served the county in five different building locations, none of which were designed to meet its needs. The current location, at 200 Warner Milne Road in Oregon City, has been home to Extension since 1983. The new building will be a state-of-the-science, all wood and energy-efficient structure. "We want to showcase our wood products industry with the best in today's technologies," said Mike Bondi, Clackamas Extension regional administrator. 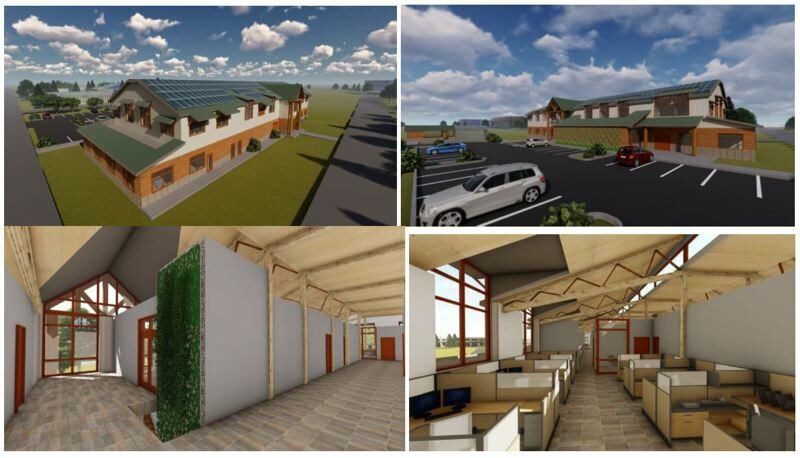 "We expect the Education Center to be the first cross-laminated timber building and the first net-zero public building in the county." Cross-laminated timber is a recent construction design feature using laminated wooden beams and panels to build multistory buildings, including skyscrapers. Net zero is a concept demonstrating the ability of the building to generate enough power to meet its consumption needs for the year. Solar panels, super-insulation and proper orientation of the building will be key design elements to achieve this goal. The building will be an education in itself, according to Bondi. "Visitors will be able to learn about the region's wood products, advances in technology, and how our forests can be managed sustainably to provide these benefits to the community," he said. "Our energy-efficiency features will demonstrate ways to plan for the energy needs of our own homes and our communities in tomorrow's world." Next, the building will go through the Oregon City permitting process, and if all goes as planned, it will break ground in the spring of 2019 and be completed in the first part of 2020. The proposed Education Center comes with a price tag of approximately $10 million. Over the past 10 years, Extension officials have put aside money from the district tax base to fund the center. By the time the new facility is completed in early 2020, approximately $7 million in savings will be available.